This early 65 has the "2" stamped above the serial number. Can you see a flaw? It's the bridge pickup. It's slightly rotated clockwise one or two degrees. It should be parallel to the neck pickup but it isn't. I'm sure it has zero effect on the tone and zero effect on the value. This 64 has the "2" above the serial number over to the right of center. The "2" is smaller than the serial number font. On others, I've seen the 2 under the serial in the same font as the serial. which point the QC department would have had to have gotten much larger. There’s a big difference between knocking out a few dozen guitars a day and a few hundred. Even so, the percentage of factory seconds seems very low and the flaws are generally imperceptible. Most often, it’s a tiny finish flaw-but sometimes it was something more sinister. The first question I usually get when I have a factory second is “does it lower the value of the guitar?” Conventional wisdom says no. If you can’t see the flaw, then the appearance of a tiny number “2” isn’t going to make much, if any, difference. If you can find the flaw and its something benign, like a drip or run in the clearcoat or a dark spot in the red dye, then take off a buck-nobody cares. But there have been some other flaws that I’ve seen that might set off an alarm or two. There was the 65 with the splice in the wood in the cutaway. The dealer insisted it was from the factory that way (the guitar had the “2” stamp) but I thought it was a repair-a really good repair. Could it have come from the factory that way? I suppose it could have but if I was the QC guy, I would have labelled it “BGN”. BGN? WTF? “BGN” stands for “bargain” and is stamped on guitars that have more serious flaws. Unlike the factory seconds, I’ve heard that “BGN” guitars were sold only to employees of Gibson and not the general public.. BGN guitars have more obvious flaws like veneer separations or poorly aligned center blocks or neck joins. I don’t believe a simple finish flaw is a ticket to the “BGN” bin. Generally, on a factory second, I can’t find the flaw or it’s something really, really minor. 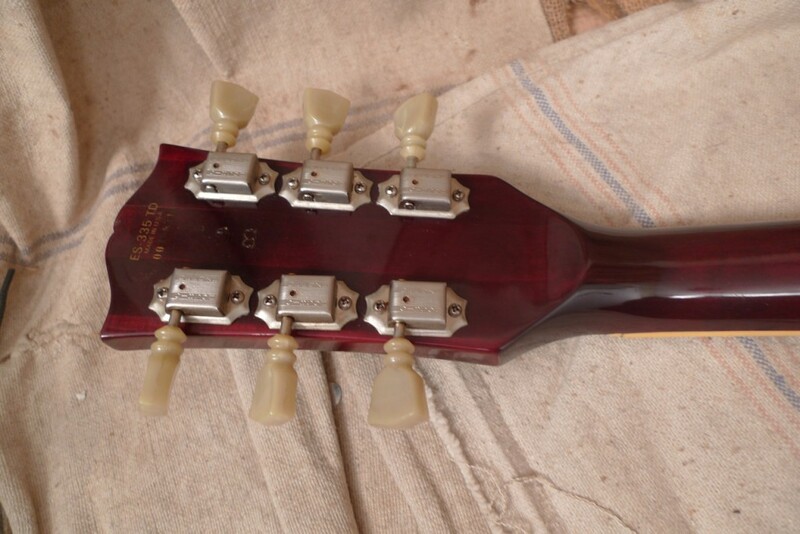 I had a 63 ES-345 with a couple of clear coat drips on the headstock. 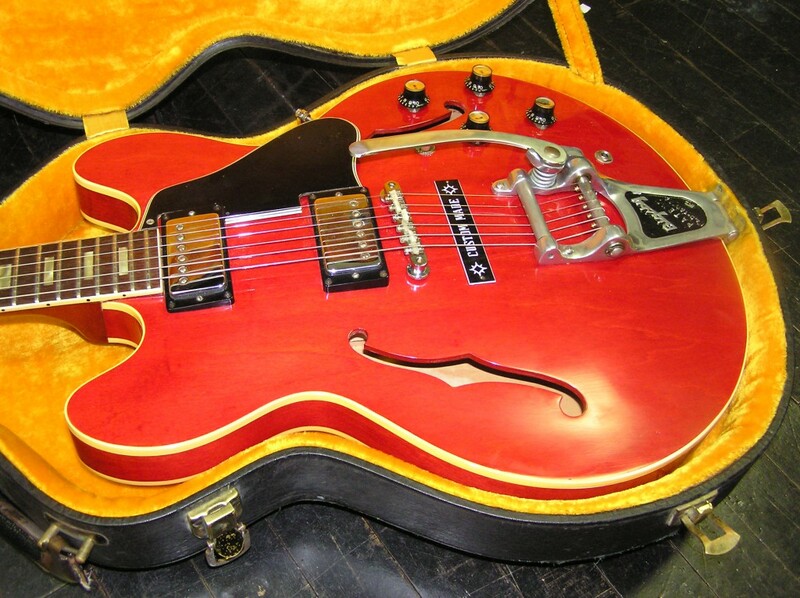 I recently sold a stunning 64 ES-335 that had a small spot on the back where the red dye was applied a little too heavily. But it isn’t always the finish. I have a 65 factory second that has a poorly placed bridge pickup. It’s cocked about 2 degrees off its proper axis. The rout is straight but the assembler who screwed the ring in had a few extra martinis at lunch that day. There are plenty of flaws that don’t qualify as factory seconds but we’ll cover that another day. One final note-Gibson no longer sells factory seconds. According to the Gibson CEO (in a forum post), they are sawed in half and thrown away. The rationale is that Gibson no longer “condones” mistakes which is sort of noble, I suppose, but it seems a waste of resources. Worse than that are all the stories I hear about new guitars being returned to Gibson for serious flaws. Granted, you don’t hear about the good ones but if errors aren’t condoned, then we shouldn’t be hearing about returns, should we? 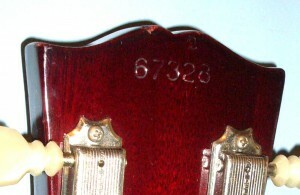 Note the BGN stamp between the tuners. This guitar would have had a flaw more serious than a paint issue but not necessarily one that would affect its playability or vintage value. Thanks to my friends at Southside Guitars for the photo. Charlie, thanks for another cool posting. I agree, I’ve never seen Gibsons with factory 2nd markings that were so flawed it would impact their desireability or value! Hey Charlie, I have a bit of a mystery that you may be able to shed some light on. I have a friend with a ’75 ES 335 with a small font capital “R” about 1/4 inch below the serial number. It is finished in the wine red burgundy color (not sparkling burgundy of the mid ’60’s) and built before the coil tap switch came into production. Does this mean the guitar was factory re-finished? I’ve never seen this mark before and it is definitely NOT a “2”, as stamped on a second. Thanks for your input. Correction: 1976 model 335. Thanks! Never seen it before-could be for “repair” or “refinish” I suppose. The wine red color was available by 76, I think, so it may not be a refinish. Maybe “reject”? Hi Charlie, really enjoying your blog! I know you don’t go past ’68 (apart from the ’81-’85 RIs), but I have been wondering if you ever saw something like “PROMOTIONAL NOT FOR RESALE” stamped on the back of the neck? I have this on a 1990 ES-347 that I picked up not too long ago, stamped in block letters above the serial no. and I’ve been wondering what could be the provenance of something like that?